1. 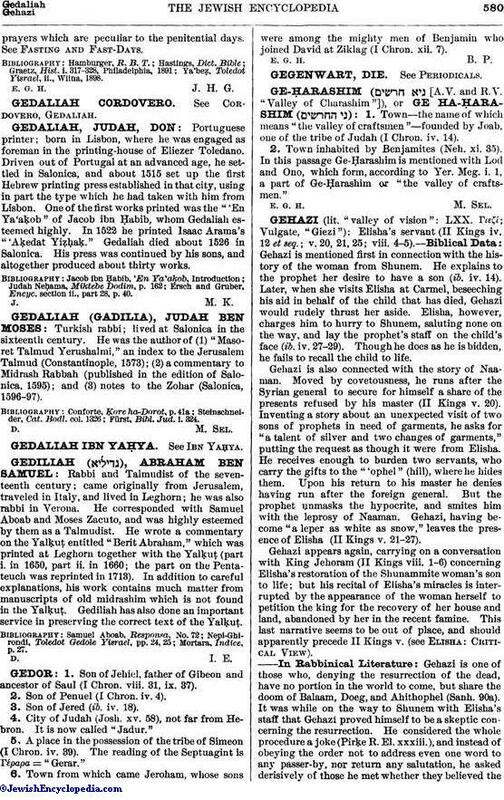 Son of Jehiel, father of Gibeon and ancestor of Saul (I Chron. viii. 31, ix. 37). 2. Son of Penuel (I Chron. iv. 4). 3. Son of Jered (ib. iv. 18). 4. City of Judah (Josh. xv. 58), not far from Hebron. It is now called "Jadur." 5. A place in the possession of the tribe of Simeon (I Chron. iv. 39). The reading of the Septuagint is Γέραρα = "Gerar." 6. Town from which came Jeroham, whose sons were among the mighty men of Benjamin who joined David at Ziklag (I Chron. xii. 7).